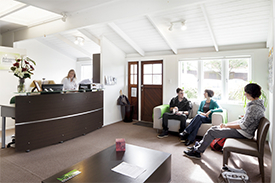 Advanced Health Chiropractic has served the Auckland community for decades. Our family-friendly environment is ready to meet the health needs of all generations. Designed with your family in mind, we have a playground for children in the middle of the practice and a pregnancy and feeding room for mums to relax in. We’re ready to take care of you and your family members from the moment they’re born through to adulthood. interference to give the ultimate expression of life for people in our community. We provide care plans tailored to your needs. The highest level of service will always be given to you. We’ll get to know you and your family, establishing lifelong bonds with each of you. The care you receive is customised to give you the results you’re seeking, whether you’re in pain or simply looking to reach the highest levels of health possible. Are you looking for a health care centre to cater to your entire family’s unique needs? Contact us today to find out more (09) 818 8015.